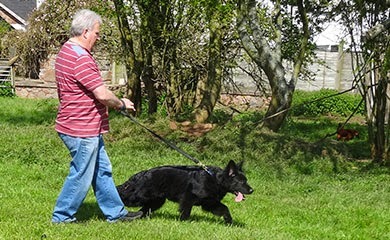 Ken and his wife Lin had puppy walked Boris from 7 weeks of age until Ken recently became unwell with what was thought to be a gall bladder problem. Lin had also been waiting patiently for a back operation and so reluctantly they had to give up looking after their beloved Boris. Sadly worse was to come as Ken was diagnosed with Pancreatic cancer and within a matter of weeks he tragically died in hospital in the early hours of Wednesday 8th October. 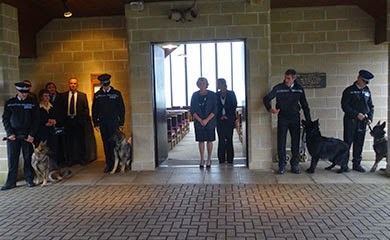 Boris and I with my Initial Police dog course are pictured above getting ready to form a guard of honour and pay our respects. 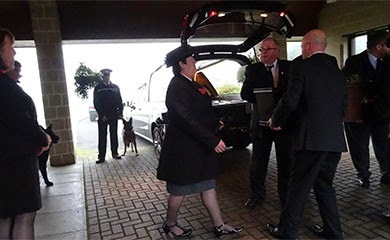 The above shows Boris watching as his former master and dear friend Ken arrives before going into the chapel for what was to be a lovely service and tribute from his family and friends. 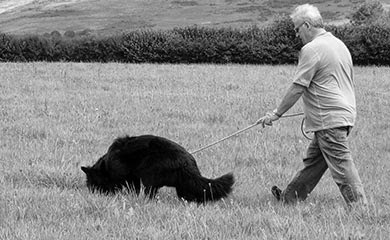 Ken and his wife Lin had only retired a year ago and because they had always enjoyed owning German Shepherds decided to try puppy walking for the Police. Up until Ken’s illness they had been enjoying raising Boris at their cottage near Newquay. They did a tremendous job and loved attending the fortnightly training sessions with the other B litter puppy walkers and puppies. 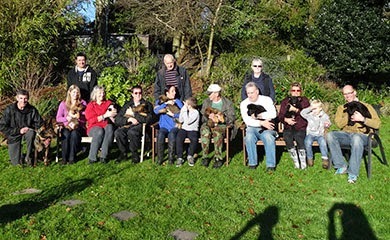 the above shows all the puppy walkers on the same day with their pups from the B litter with mum Mollie watching on. We are all still in shock and I will miss our training sessions together. Lin is going to keep in contact with everyone from our group and the dog section and will be watching Boris’s progress with interest. I am sure Ken will be a very interested observer also. I have included some pictures of our time together below. Christmas will be here before we know it and within the Corporate Communications department our thoughts have turned to the Force Christmas card... and we thought it would be a lovely idea to hold a competition with the prize of naming a puppy and to spend an hour with Paul, Ruby and her seven puppies at their home near Exeter. and lastly your imagination to create a fabulous image for the Force Christmas card that includes a police puppy reference somewhere within the design. Your contact details (including your address) and your parents or carers contact details, or if doing it through a school, the school address and teachers name. Post all A4 paper cards to Corporate Communications, Devon & Cornwall Police, Police Headquarters, Middlemoor, Exeter. Devon. EX2 7HQ. If you want to keep the card please scan the card and save as a jpeg no bigger than 5mb and email to websitemessaging, we will be unable to return cards. Please note: If as part of your art work you use a photograph of someone please ask their permission and if they are under 16 their parents or carers permission. All the cards will be looked at by the Corporate Communications team and five will be selected for our Chief Officers to select a winner. If many card designs are received then three from each age group will be selected and shown to the Chief Officers and they will select one form each group and we will have three winners. What happens to the design? 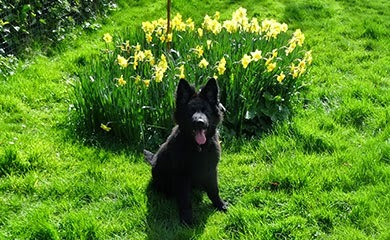 The winner/s will be able to visit Paul and the puppies with their mum Ruby to name the puppy. 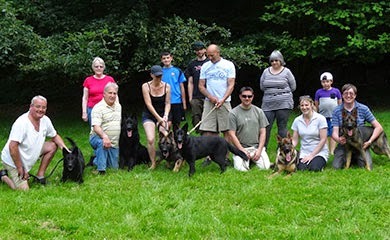 You will get to spend up-to an hour with them and will have the opportunity to ask Paul any questions on training police dogs, or about dogs that you might have. We will email or telephone to arrange a date. The name for the puppy must be suitable for a working police dog and must begin with the letter C.
The design must have a Christmas or seasonal theme that includes a police puppy reference somewhere within the design. 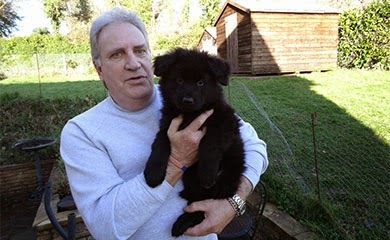 If you are unable to visit the puppies within a short period after the competition closes Paul will select the most suitable puppy to have your suggested name. Schools and colleges can take part and if they include the name of the school within the contact details that will be published on the electronic card if one of their pupils is a winner. 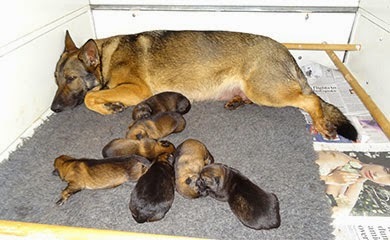 Good luck to all and here is the latest (28/10/2014) video of Ruby and her puppies. 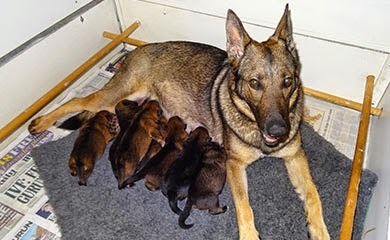 After a tough first 48 hours I am happy to say that Ruby and her pups are now all doing really well. All have more than doubled their birth weight which is a good sign and all are moving about the whelping box very energetically and very fast. 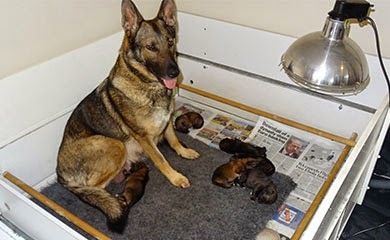 Ruby has been a fantastic mum just as she was last time. A few are starting to open their eyes and when you next see them in a week’s time they will all be hearing and seeing. I have included some pictures from today and 2 short video’s showing mum feeding her pups and the pups on their own in video 2. Taking into account that the average time from mating to whelping is 63 days Ruby was due to have her pups around Wednesday 22nd of October. She was absolutely huge and I suspected a very large litter comparing how much bigger she was this time than she was with her A litter. On Sunday this week I was down in Plymouth completing the final suitability to be Police dog assessments on the B litter (I will tell you about those later this week) when my Wife told me to get back home as Ruby was shredding her bedding in her whelping box which is one of the signs of whelping being imminent. This can go on for several days but on average lasts for between 6 and 12 hours. 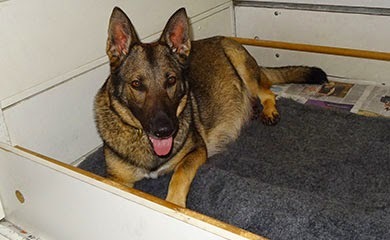 When I got home things had settled down and here she is relaxing in her whelping box on Sunday night. I slept alongside her for the night on a transit bed to monitor her and those of you who were traumatised by a picture of me doing the same thing on the last litter with no shirt on can relax I have no photo this time. She was very restless in and out of the garden all night. None of us got any sleep but it was worth it when she eventually produced her first puppy at 9.10am on Monday morning. 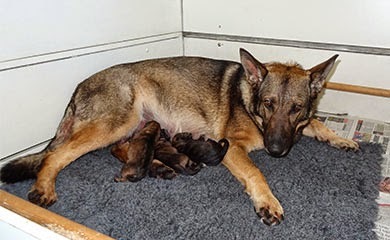 She produced a second pup at 10.15am and a third pup at 11.15 am. 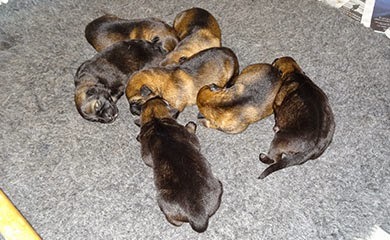 By 2pm no more pups had arrived and we thought that might be it. Ruby seemed very relaxed and so were her 3 pups. 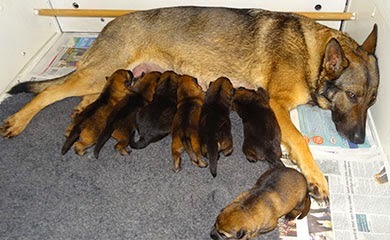 At 2.15pm she then had a fourth pup and then a fifth pup at 3pm. 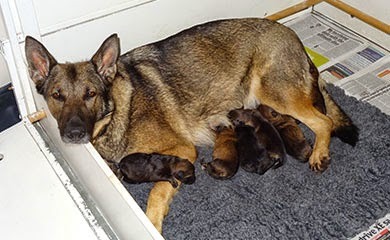 She really had to work hard to deliver these pups and I was concerned at how tired she was looking. My worry was that if there were further pups she would have trouble delivering them. I discussed it with our vet and the decision was made that if no further pups arrived by 6.30 pm he would come to our house and give Ruby an injection of Oxytocin to ensure the uterus closes down properly and to assist with a quick delivery of any unborn pups. 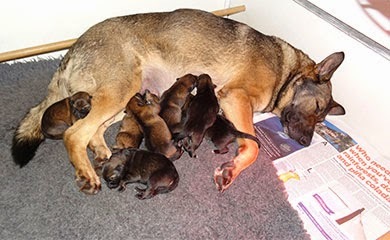 Ruby then had 2 more pups at 4.50 pm and 5.10 pm and all seemed well with mum and her 7 pups when we went to bed at 11pm. Then disaster struck at 3am when we heard Ruby whining and we could see she had delivered a fully formed dead pup which we could not revive. I asked the vet to come out to administer an Oxytocin injection. In the time we waited for his arrival Ruby delivered another dead pup which could not be revived. Our vet duly arrived and administered the injection and within 10 minutes poor Ruby delivered a third dead pup. Ruby then seemed to settle down and seemed much happier now that everything was obviously clear. I was very sad for her but in a strange way I was also relieved that she would not have to go through the extremely hard work of raising 10 pups had they survived. I was extremely proud of how hard she worked and even more proud of the way she allowed the vet to examine her while her pups were crying and she wanted to get back to them. Thankfully everything then settled down and Ruby was very contented with her 7 pups. I don’t know if you are aware but when pups are born they completely deaf and blind. They open their eyes between days 7 to 10 days and their ear canals open around 14 days. 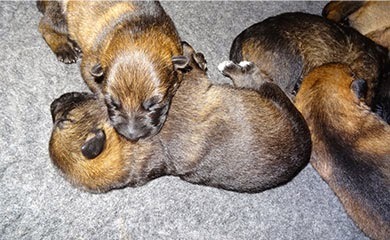 The below shows the pups around 24 hours old lying together in a huddle keeping warm while I was taking Ruby outside to spend a penny and to allow her to drain and have a good stretch. 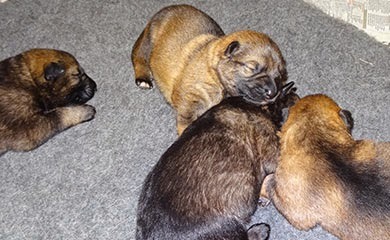 Puppies are born with an immature brain and nervous system and with eyes and ears tightly closed an enormous amount of development has to take place in the first few weeks. 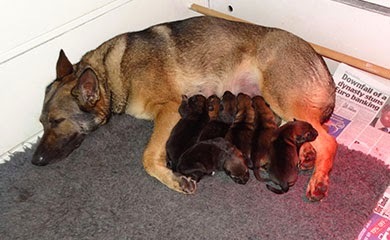 Their body temperature is low compared to adult dogs and they can only keep up their body heat by lying against something warm, either the mammary glands of mum, a heat pad or heat lamp. New born puppies are never still, they twitch and jerk and stretch their limbs constantly either suckling or sleeping. This reflex action called activated sleep serves to develop and exercise the nerve and muscle system. 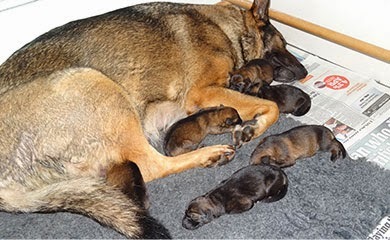 Mum is pictured relaxing with her 7 pups who all seem very content 48 hours after being born. She had 3 boys and 4 girls the same as last time. The first 36 hours are crucial to their survival and I am happy to say three days in the pups are all looking strong and well nourished so fingers crossed. 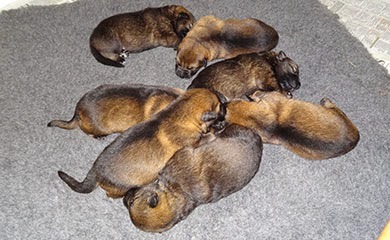 Here are a selection of photo’s of mum and pups taken on Wednesday and Thursday. 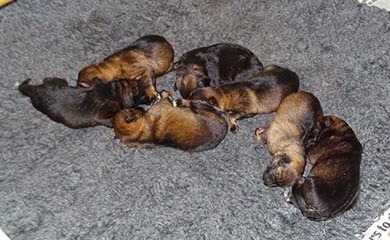 I have recorded a short video to show you the pups and although they are not doing a great deal at this stage I will be posting a short video each week so you can see how they are progressing. See you all next week with another update. 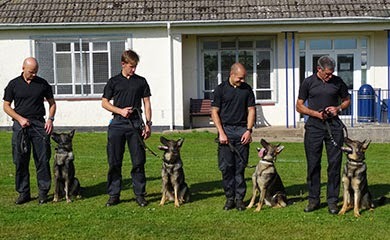 We started our new Initial Police dog course 4 weeks ago and it will run for another 9 weeks when hopefully all the dog teams will successfully graduate to become fully fledged Police dog teams. 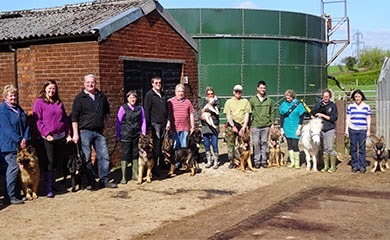 It is a very demanding but enjoyable course where these high energy determined dogs finally get a chance to do what they were no doubt born to do ie work. This is something that very few dogs bred to work get to do in the modern world hence the reason why so many end up with behavioural problems. 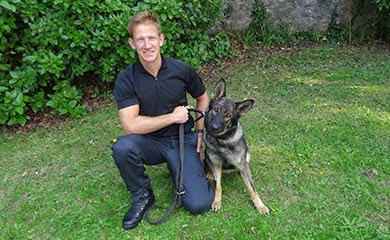 Picture 1 is Trainee Police dog Ash with her handler PC Ben Jobes who will be working in Camborne. 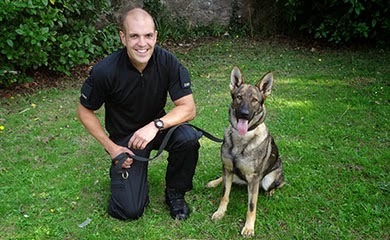 Picture 2 is Trainee Police dog Annie with her handler PC Lee Crampton who will be working in Exeter. 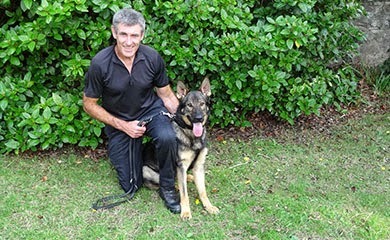 Picture 3 is Trainee Police dog Grommit with his handler PS Alan Knight who will be working in Exeter. 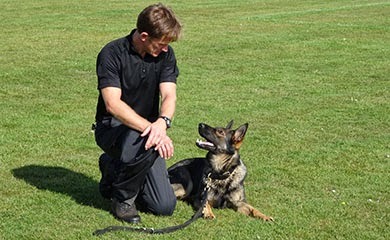 Picture 4 is Trainee Police dog Argo with me. 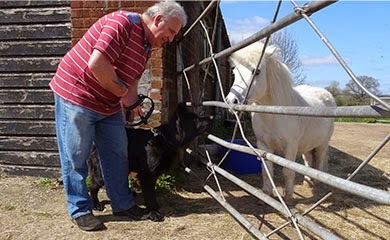 Argo is our spare dog who is being being trained and handled by me. If for any reason any of the other dogs fail to graduate then he will take their place. 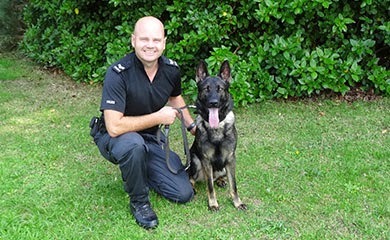 If everyone is successful then Argo will go to another force as a fully trained Police dog. Picture 5 shows the 4 of us together at the start of our course. 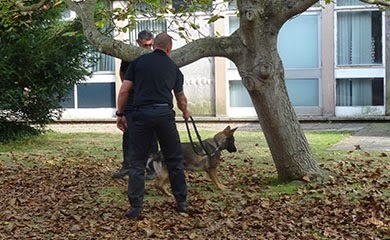 Picture 6 Shows Trainee Police dog Ava being introduced to her new handler PC Steve Budd from Dorset Police. 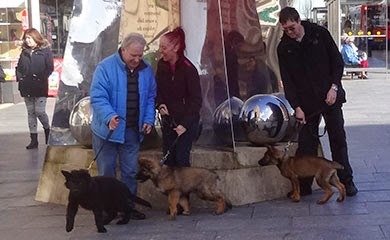 Ava is with her puppy walkers Ed Harris and Lowri. 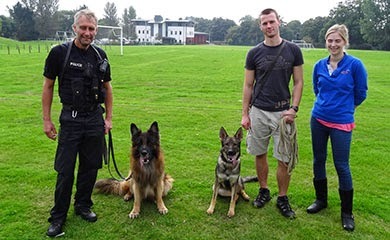 Ava and Steve started their training at Surrey Police dog training school 3 weeks ago and are doing extremely well. 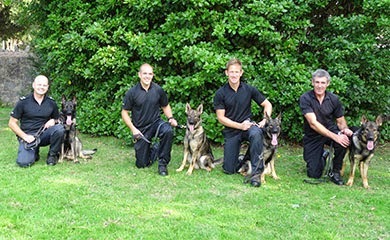 The more astute among you who follow the blog will know that Police dogs Axel and Arry graduated in August this year and that our 4 A litter dogs mentioned above ie Ava, Annie, Argo and Ash means that one of the litter is missing. You are correct unfortunately we made the decision to release Anya the 7th member of the A litter in August because of her lack of size. 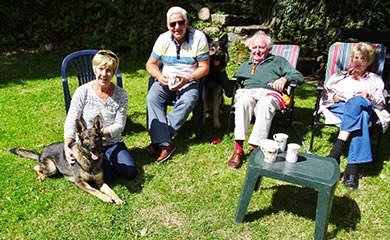 The good news is we were able to find her an excellent home with Jane and Graham Crowley who are experienced German Shepherd owners in Plymouth who recently lost their last German Shepherd. 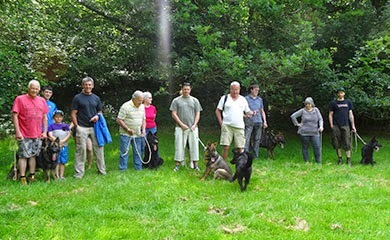 Picture 7 shows Anya on Sunday 10th August being introduced to her new owners Jane and Graham. 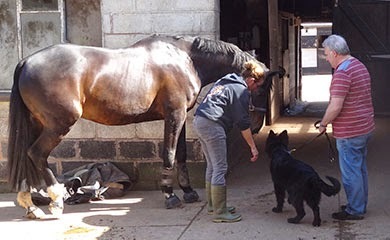 She has settled in well and is now Jane's constant companion. 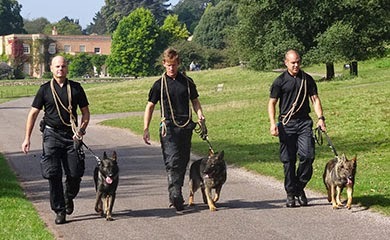 Over the weeks ahead I will introduce you to some of the work and training that we do on the course. At the moment we are still in the early stages of building a solid foundation in all aspects of the training before we move forward. These early stages are about building confidence, making sure the dogs are enjoying the work and building the bond between handler and dog. 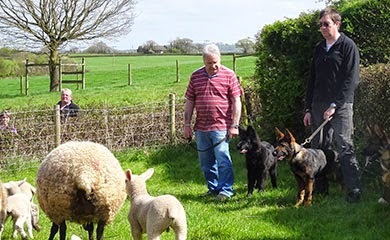 If the bond is strong these wonderful dogs will pretty much overcome everything that is thrown at them because of the trust they have in their handler. Picture 8 Shows the teams starting this early work on control getting good focus and concentration which is all built through play. Also note the close proximity in which the dogs work together which is extremely important. 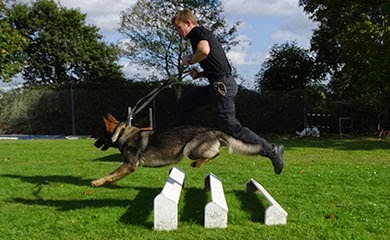 Here are a selection of photographs ( Pictures 9 to 14 ) showing the handlers working on control and agility exercises. 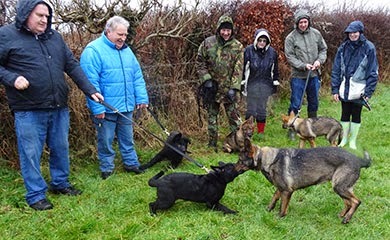 Picture 15 shows the dogs starting their training to deal with a violent of fleeing criminal. 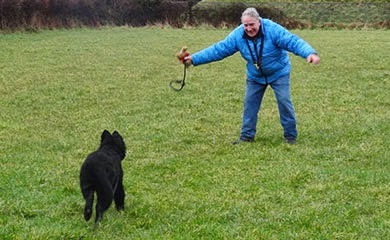 Although we train a dog to attack a violent or escaping criminal the handler must always satisfy him or herself that use of the dog was both proportionate and necessary. 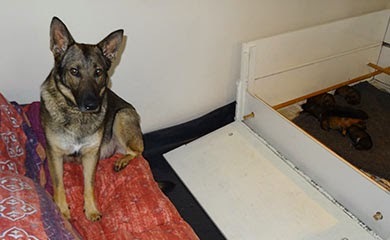 Whenever a dog is used to bite or detain a person the handler must submit a detailed report outlining why the use of the dog to bite was necessary. Picture 16 shows Ash searching for hidden property which in this case is a bunch of car keys. She is taught not to touch the item so as not to destroy any DNA on the item. Her method of indicating property she finds is by freezing and staring at the item. 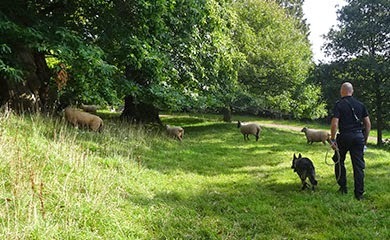 Pictures 17 to 21 show the dog teams learning to walk through and ignore livestock such as sheep and cattle. We call this rural schooling. 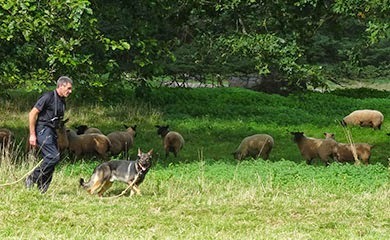 This is vitally important for Police dogs who often have to search in rural areas for outstanding criminals or vulnerable missing persons and must not be distracted whilst working. 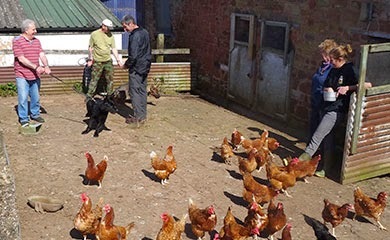 Picture 17 shows me demonstrating to the students how to operate the training line as we pass through livestock. Picture 18 shows Ben and Ash negotiating their way through cows. Picture 19 shows Alan and Grommit approaching a large herd of sheep with Grommit behaving perfectly. 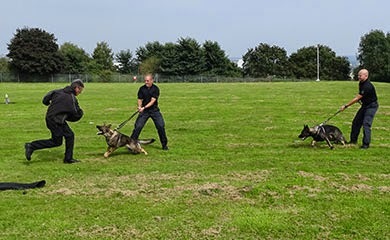 Picture 21 shows the 3 dog teams practising walking together under total control. 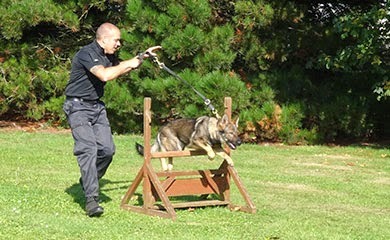 Finally pictures 22 to 25 show the dog teams training on Urban schooling. 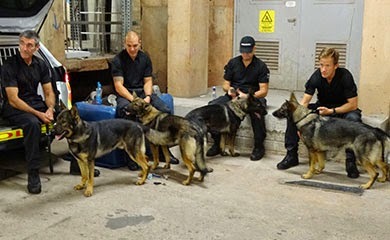 This involves the dogs being completely relaxed and safe working in crowds and town situations. 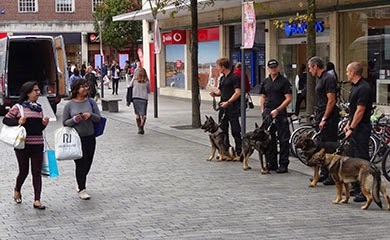 This is vitally important as a Police dog can be expected to perform high visibility foot patrols in busy crowd situations such as shopping centres and he/she can also be required to deal with violent disorderly crowds. The Police dog must be able to differentiate between the two. 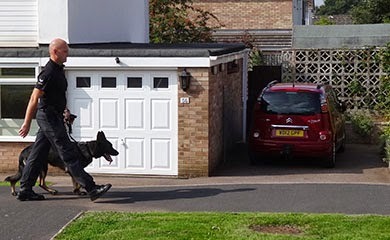 Picture 22 Shows Alan and Grommit practising on a housing estate to walk in a relaxed manner. 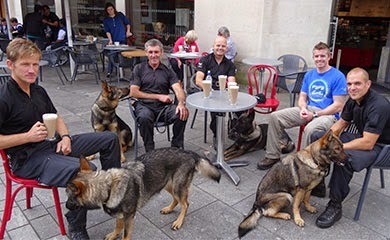 Picture 23 shows the team getting used to being in close proximity as we are about to go into Exeter city centre. Picture24 shows the teams just about to set off on individual foot patrols in the crowds. Picture 25 shows the group enjoying a well earned coffee at the end of a very busy day. 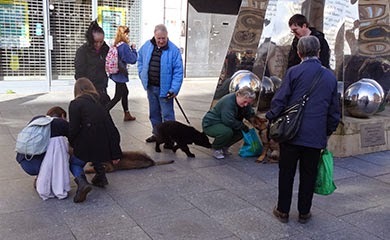 As always we were inundated with well wishers asking about the dogs and wanting to take photographs. As you can see the dogs were very relaxed and well behaved. 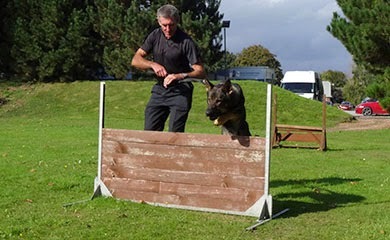 We are one of the only Police forces that I am aware of who include both urban and rural schooling in their Initial Police dog courses. 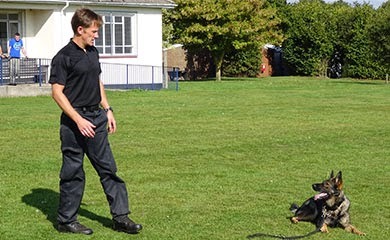 In an age when forces are cutting the length of their courses to save money our force have taken the view that such training is of vital importance to maintain safe well balanced working Police dogs.